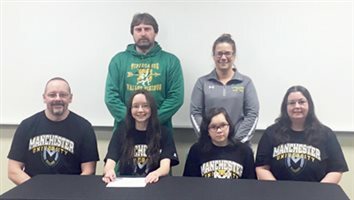 Tippecanoe Valley High School senior Haley Hoover will continue her academic and running careers at Manchester University, where she will compete for head coach Brian Cashdollar. Hoover is a four-year participant for the Lady Vikings in both cross country and track and field. NORTH MANCHESTER – Three goal scorers propelled the Manchester University men’s soccer team to a 3-1 win over Anderson Wednesday in a Heartland Collegiate Athletic Conference home match. NORTH MANCHESTER – Mark Adkins, Manchester University sports information director, is returning to his roots in the upper Midwest. He has accepted the SID job at Morningside College in Sioux City, Iowa, and will leave Manchester in early October. His replacement has not yet been named. Mark Adkins, Manchester University sports information director, has been tapped to chair the College Sports Information Directors of America U Committee. 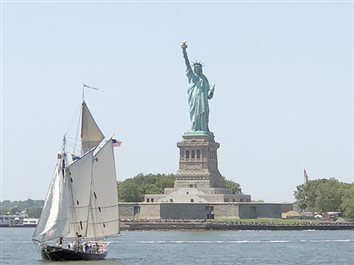 A trip to New York City in mid-July was beyond any “dad moment” for Manchester University head baseball coach Rick Espeset and Director of Cross Country and Track and Field Brian Cashdollar. 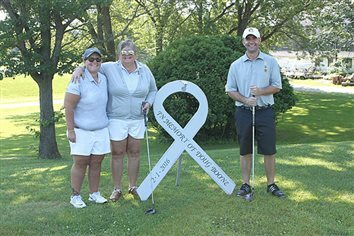 Amid the din of discussions and stories being recounted at the 2018 Manchester University Kickoff Classic golf outing Saturday, one reflection may well have stood out more than any other. Second Annual Don Dicken Appreciation Golf Tournament; Manchester University Football To Host Golf Outing; Fall Sports Practice Times For Valley; WCHS Adult Tiger Booster Club Ads; Warsaw Football Practice Info. Delanie Jones and Brandy Whitaker are thousands of miles apart geographically. Professionally, though, they couldn’t be closer. NORTH MANCHESTER – To celebrate the rich tradition of Manchester University football, head coach Nate Jensen and his staff announced the third year of the Kickoff Classic Golf Outing. NORTH MANCHESTER – If you ever met Doug Boone, you were a friend for life. 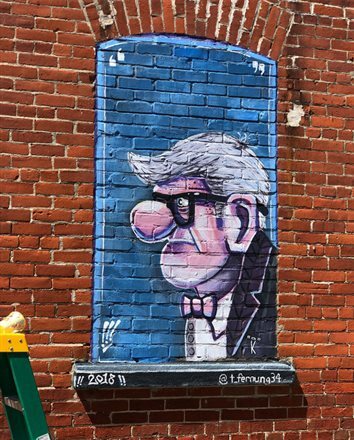 NORTH MANCHESTER – Artistry isn’t hard to imagine on a football field. NORTH MANCHESTER – Memories weren’t in short supply at Manchester University from June 5-7. 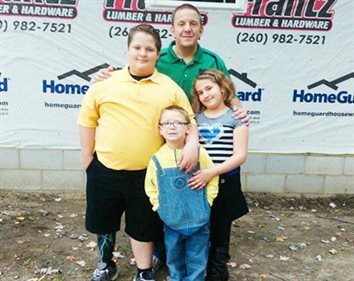 Strength is something Brady Nyland thinks about every day. Whether it’s due to his work in the Brown Fitness Center weight room as a board member of the weightlifting club or as a member of the Manchester University football team, the rising senior offensive lineman from Avon, Ind., isn’t far away from developing the outer or inner persona. NORTH MANCHESTER – Two men, two different life resumes, one common thread. 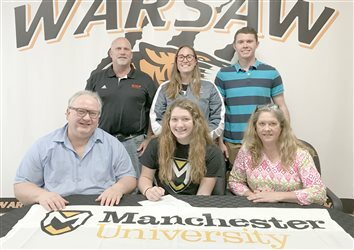 Warsaw Community High School track and field senior Madison Haines has announced her intention to attend Manchester University this fall and compete with the Spartan track and field program. NORTH MANCHESTER – A gentle nudge. 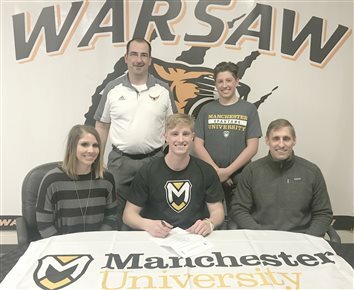 Warsaw Tiger multi-sport athlete Dane Stookey announced his intention to continue his studies and athletic participation next fall at Manchester University where he will compete for the Spartans’ track and field team. NORTH MANCHESTER – The Manchester University Department of Exercise Science and Athletic Training, along with the College of Business, invites local children to participate in the Manchester University Youth Triathlon. 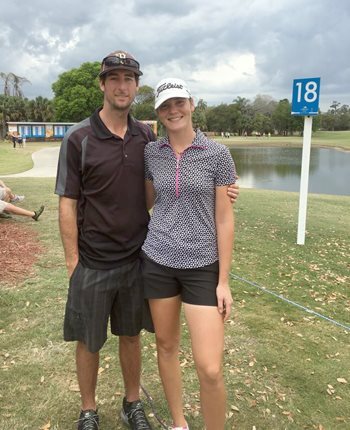 NORTH MANCHESTER – The phrase “paying it forward” isn’t too far off the minds of Manchester University junior Connor Eichenauer and freshman Karly Eichenauer. NORTH MANCHESTER – Hannah Wappes is Manchester University’s first indoor sub 5:00-miler, a member of the cross country program’s all-time top 10 fastest clockings in the 6K, and an individual ranked among the Black and Gold’s best ten outdoors in the 400, 800 and 1500 meters. To think … all of this quite possibly could not have happened. 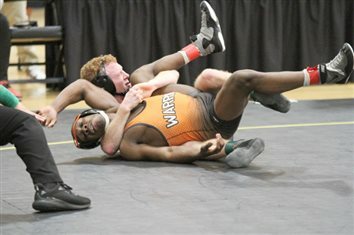 NORTH MANCHESTER – Connections are and have been a big part of Chase Wilson’s life. Manchester University senior football student-athlete Eric Beard is one of 181 individuals named semifinalists for the National Football Foundation’s William V. Campbell Trophy presented by Fidelity Investments in an announcement made Wednesday. ANGOLA – A 23-point deficit against in-state NCAA Division III rival Trine University was anything but that Thursday for the Manchester University Spartans. 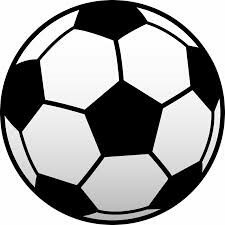 Manchester University’s athletic department is holding its annual soccer camp this week. Shaun Tilghman is no different. NORTH MANCHESTER – There are usually two sides to every story. It was late fall in 2015. 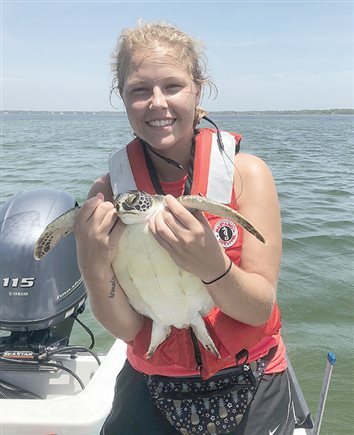 A college lecture changed Ashlea Nash’s career path. 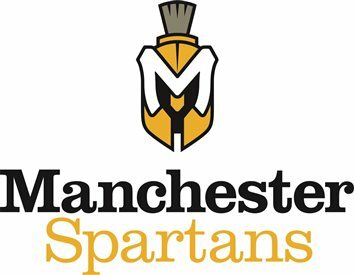 Manchester University head football coach Nate Jensen announced Monday that Scotty Cole has joined the Spartans’ staff as an assistant. 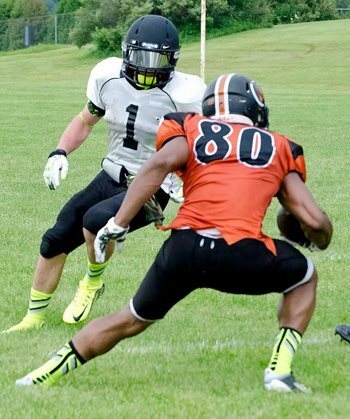 Cole, a former two-time all-Michigan Intercollegiate Athletic Association defensive back and Alma College team Most Valuable Player in 2011, will guide the Black and Gold’s defensive backfield. 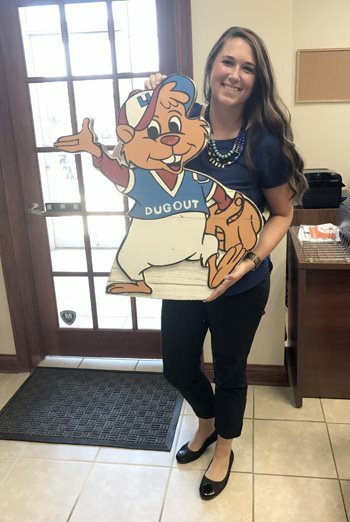 Sliding into third base, smashing a double into the gap, leaping for a ground ball … that was what Danny Maringer looked at in regards to sports for a good share of his life. Matt Talarico is a creative thinker. 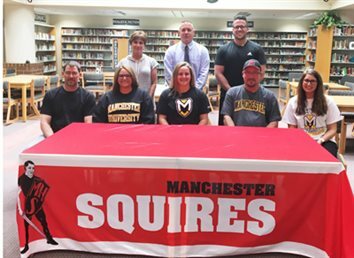 Manchester High School senior Bailey Sewell signed a letter of intent Wednesday to continue her academic and track and field careers at Manchester University this fall. In announcements made by the NCAA Tuesday, the Fort Wayne Mastodons and Manchester University Spartans were selected to host a total of five separate NCAA basketball championships events, starting in 2019, all taking place at the Allen County War Memorial Coliseum. Visit Fort Wayne and the Memorial Coliseum partnered with both local institutions to submit a total of 25 bids during the summer of 2016, for events taking place from 2019 to 2022. The NCAA announced championship event hosts for all sports in all three divisions for all four years. "Fort Wayne has a proud tradition of basketball and hosting visitors, and these events will be excellent opportunities to expand our sports tourism resume," adds Dan O'Connell, President of Visit Fort Wayne. 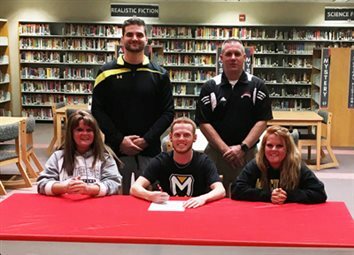 Manchester High School senior Braxtin Wilson will continue his academic and wrestling careers at Manchester University next fall. A recap of Manchester University athletic competitions for the weekend ending Sunday. NORTH MANCHESTER – The softball game between Manchester University and visiting Alma College was rained out. A makeup date is to be announced. 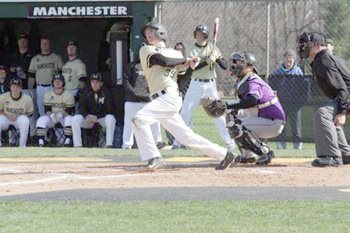 Junior outfielder Mikayla Deisler rapped three hits in four at-bats, leading Manchester University’s offense Thursday. Deisler delivered one of the squad’s five hits in a five-inning, game one 10-0 loss to visiting Taylor University. Continuing an afternoon and early evening when her batting average soared 100 points the junior came back in the nightcap to go two-for-two with a run scored as part of a close-knit 6-3 loss. A combined six men’s and women’s basketball team members were recognized from Manchester University on the 2017 all-Heartland Collegiate Athletic Conference awards, released this week. Coach Josh Dzurick’s women’s program, which concluded the 2016-17 season at 9-16 overall and 8-10 in the league, had senior guard Jenifer Lee and sophomore guard Faith-Alexis Graham placed on the honorable mention list and freshman guard Brianna Henson named to the Sportsmanship team. Manchester University has enjoyed plenty of on-field success in the two decades since Rick Espeset arrived on campus. The motto “early to bed and early to rise makes a man healthy, wealthy and wise” is a portrait of Kevin Kling’s life. Among the early-morning custodial crew at Manchester University where his work deals with upkeep of the Physical Education and Recreation Center among other areas, he can be seen wandering through the dark hallways and along the sidewalks of campus diligently preparing the campus for a new day. While his job is usually done at 3 p.m., Kling’s daily duties don’t stop there. A quartet represented Manchester University women’s soccer on the 2016 all-Heartland Collegiate Athletic Conference teams released Tuesday. Coach Christine Johnson’s team placed junior midfielder Courtney Hersick on the first team. Sophomore midfielder/forward Maranda Birmingham was named to the second team; junior defender Jaclyn Scialdone took a spot on the honorable mention list; and junior midfielder Jenny Pudlo was the Spartans’ Sportsmanship team honoree. 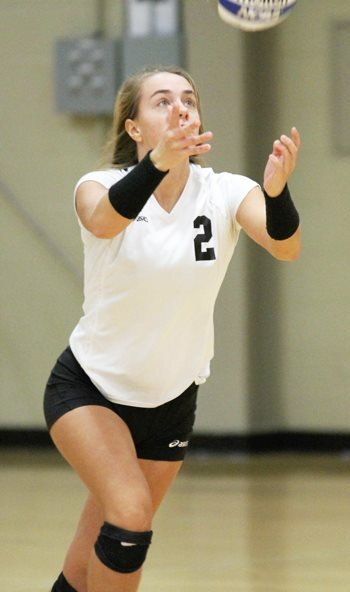 A straight-set 25-12, 25-11, 25-19 win over Wright St.-Lake went in Manchester University’s annals Wednesday. At night’s end, the final outcome wasn’t the headline. 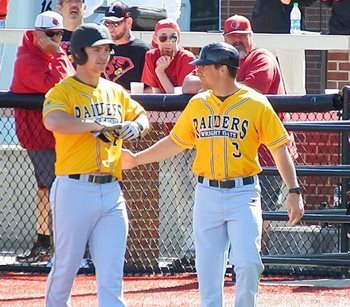 Recognizing a pair of student-athletes who have helped lead Manchester University to its first set of back-to-back Heartland Collegiate Athletic Conference tournament berths since 2006-07 and 2007-08 was. Outside hitter Courtney Chowning blasted 11 kills and turned in a pair of solo blocks, and setter Heather Racine registered 34 assists and served up four aces in their final appearance on Stan Weller Court honoring Coaches Hoffman and Wolfe at Stauffer-Wolfe Arena. A seventh successive Heartland Collegiate Athletic Conference postseason tournament appearance and 6-7 overall and 5-3 conference record were rewarded for Manchester University with the release of the all-HCAC women’s tennis honor teams this week. 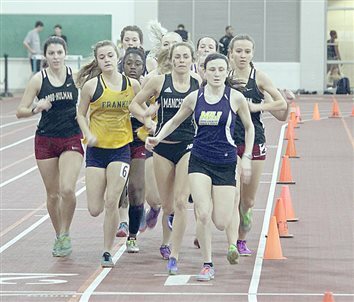 Manchester University spent a second consecutive week on the United States Track and Field and Cross Country Coaches Association’s Division III Great Lakes regional poll released Tuesday.